Congratulations to Marcia Black on her 20 year service anniversary. 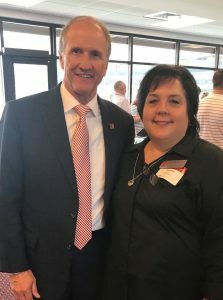 UA President Dr. Stuart Bell hired Marcia in 1998 while he was serving as the Chair of the Department of Mechanical Engineering. Luckily for us, she joined the Math Department staff in 2005. This entry was posted in News, Noteworthy and tagged #Milestones2018, Department of Mathematics.